Often things aren't just good or bad. Here are five examples: (1) solutions for problems can create new, often unexpected, problems, (2) good traits of a person can arouse envy in others, (3) what can be a strength in one situation can be a weakness in another, (4) the fact that you have achieved success feels good but can decrease your motivation to make further progress, and (5) having much knowledge about a topic can be pleasant but can create some difficulties in the communication with others. I want to say a few things about this last example which is related to a phenomenon known as the curse of knowledge (Loewenstein & Weber, 1989). The curse of knowledge means that once you have certain knowledge it will be hard for you to imagine what it is like to not have this knowledge. As we learn we manage to capture in our mind sets of related concrete experiences and facts into more abstract concepts. These abstract concepts often summarize a great number of concrete things. As we continue to learn we acquire more and more of those abstract concepts with which we can work with increasing ease. At a certain point it will seem relatively easy to work with abstract notions such as democracy, the economy or organizational policy. But a 10 year old child which has not gone through our learning processes will probably have great difficulty of understanding what these concepts mean. Um ... how would you explain them? When you understand something quite well, it may be hard to empathize with and get the perspective of someone who finds it really hard to understand. “What the hell is so hard about that? ", you may think in desperation. The curse of knowledge means that when you understand something well you can't remember well how hard it was to acquire that knowledge. And what makes it even harder: many people are not aware that there is such a thing as the curse of knowledge or that it applies to them. As Steven Pinker says: "Like a drunk who is too impaired to realize that he is too impaired to drive, we do not notice the curse of knowledge because the curse prevents us from noticing it." 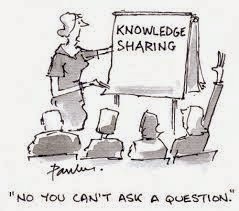 The curse of knowledge can affect anyone (sometimes I am painfully reminded of how it harms my own performance) and the fact that you are not aware of it does not mean it does not apply to you. When you explain something, invite people to tell you when you say things which aren't clear to them. When they do this, thank them and explain more simply what you tried to say. Normalize that they do not understand and apologize for perhaps having skipped some steps in your explanation of having used jargon terms. Catch yourself when you are impatient as you are trying to explain something to someone and remind yourself of the curse of knowledge. Be aware that you probably underestimate how difficult it is what you are trying to explain. Slow down and take a step back. When you are writing a text as someone with little knowledge about the topic to proofread it. Invite this person to mark everything they do not fully understand and thank them for their feedback. Do you find these tips useful?